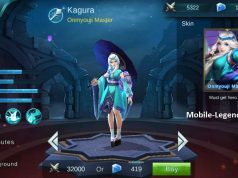 About me: I am an epic league Miya main. I am 22 years old and i am from Germany. I love to play Miya because i think that if correctly done, she can carry every team in any situation. To start of i want to tell you that this is a very defensive build wich does not mean that there is lots of defensive power rather it means that you have to play defensivly. The goal of this build / playstyle is to collect a lot of gold in a very short time. How is this possible you might ask? Well i can tell you its all about the midlane… lets stop the long talk and keep going. PASSIVE, Turbo: Each time a basic atack hits a target,the heros atackspeed will increase by 4 %, lasting 3 seconds and stacking up to 10 times. 1st Skill , Fission Shot: After use, each basic attack will fire two split arrows, dealing x points of magic damage to the main target and 65% basic atack damage to the other target(s),lasting 4 seconds. 2nd Skill, Rain of Arrows, Shoots a barrage of arrows to an area,dealing 5 hits of damage to enemies.Each hit deals x pts of physical damage .The arrow storm will slow the enemies, and after 4 hits, the enemy will be frozen in place for 1 second. 3rd Skill, Turbo Stealth: Use to remove all movement-imparing effects from yourself and become invisible for 1 second.Also raise your attack speed by 35% for 6 seconds and raise movement speed for you and your nearby teammates by 45% for 2.5 seconds. For skill order i go 2nd skill lvl 1 and than 3rd>1st>2 skill. Miya is an auto atack based hero. Wich means for you that raw physical damage is not the best way to go. 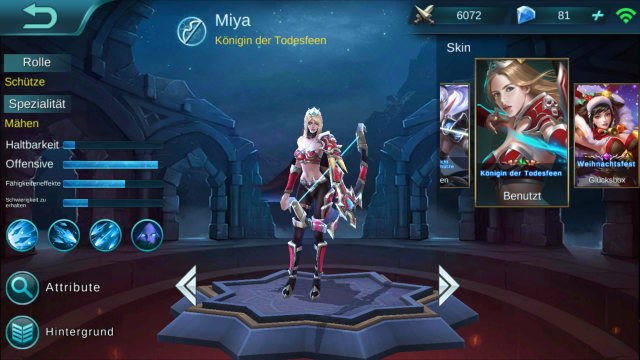 So you might have noticed that Miya´s kit has 3 effects buffing her auto attacks. This can lead to brutal damge to your enemies in the late game with the right build and fight behavior wich i will explain you in one second. Miya´s playstyle should be pretty passive in laning phase.The midlane provides us with the perfect conditions to power farm. When your game starts you will rush to midlane and push the first wave. Then you go and take the lil jungle camp on the right of the midlane . Then push your next wave and farm the creep on the midlanes left side. You will go on and on and on. This way you will be ahead in gold even without a kill. Note!!! It is important that you use ure 3rd skill to escape near death scenarios! When you have finished your first three items you should have reached the midgame . Do not overrate your damage by now i mean you can do serious damage but that depends on a bit of crit luck. (Will explain items later). Although you will not be a dps-monster by that time you can look to help your team and maybe grab a kill here or an assist there. But dont forget; try to live as long as you can if you think a scirmish is to dangerous go and look for possiblities to put pressure else where on the map. And now to the fun part xD! For my first item i almost always rush Fallen sword. It gives you Physical Attack, attack speed and lifesteal and has a great passive! :It buffs your autoatacks ! Great! ^^ Well it makes your Autoattacks do extra Physical damage based on the enemy´s current hp.A well rounded item wich synergizes with your first skill;the split arrows will deal the extra dmg too. For my second item i take Blade of destruction. you might ask yourself now why do i suggest you buying this second. This item gives Atackdamage(AD) and crit+plus a passive wich buffs you critical strike damage and if you crit it buffs your ad. But it does not give atack speed or has a usefull passive for early midgame.You are totally right… . BUT this item is pretty expensive and you should get it while you power farm. You might not have enough gold gain in mid or late game to buy it if you´re having a bad game. Thats why i suggest bying it in your power farm phase. For your third item i suggest you to get the attack speed boots.Movement speed and attack speed. For my fourth item i almost always buy Thors sting. It gives attack speed, Crit chance and movement speed. Its passive is a lightning fireing after every 5 basic attacks dealing damage to 3 enemies and raising your movement speed for a brief time. Your 5th item should be the Wind Chaser for ad and Physical penetration. And now to my favourite item.The Crazed reaper. It´s an item full of value for his relatively low cost. AD, HP, Attack speed+ 2 super usefull buffs. Awesome all we need!! His first passive will increase your movement speed after every basic attack wich makes kiting a bit easier. His second passive will lower enemy´s armor by an fixed amount x. it is not a percantage wich is great because it synergizes well with wind chaser. In the very late lategame you can sell you boots to get a Tooth of Greed wich helps you sustaining in fights . You might notice that there is no big defensive item in this build wich means you are forced to learn how to position yourself perfectly in teamfights.This build takes a lot of practice but if you master it you can easyly push your self a league higher if not more. SO this is my first guide i hope you enjoy and if you have any questions comment or message me. 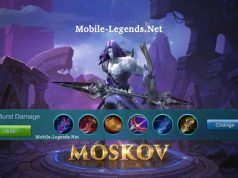 Have fun dear ML Players i am out . I tried about 4 builds for miya and yours was the best of the rest! c’mon guys we all know that its about luck on having a good teammates, experience with a whole lot of precision. i like this build because the role actually of Miya is support and reap.